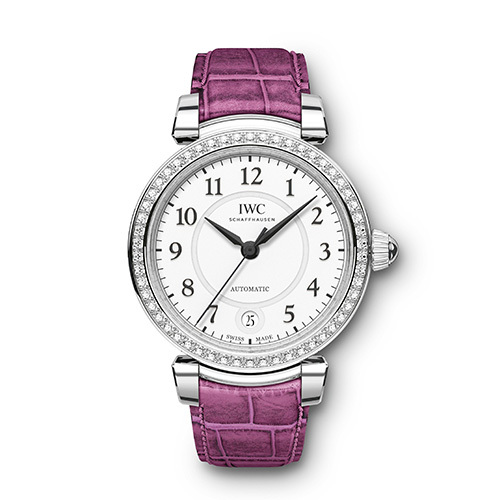 Stainless steel case with 54 diamonds. 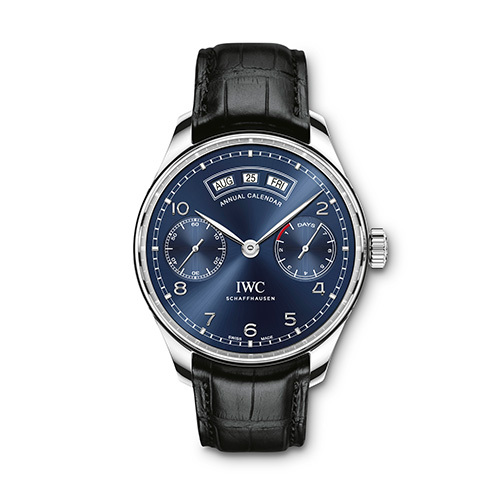 Automatic, self-winding, power-reserve up to 42 hours, central hacking seconds, date display. Silver-plated „Argenté“ dial. Raspberry pink alligator leather strap by Santoni. Dimensions 36 mm. Stainless steel case. 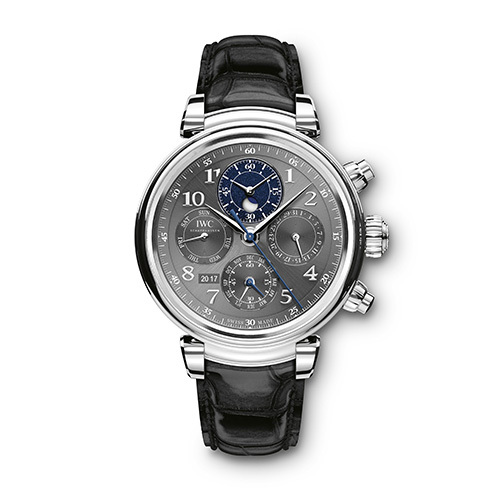 Automatic, self-winding, 89630 Calibre, IWC-manufactured movement, power-reserve up to 68 hours, perpetual calendar with displays for the date, day, month, year in four digits and perpetual moon phase, chronograph function with hours, minutes and seconds, hour and minute counters combined in a totalizer at 12 o’clock, flyback function, small hacking seconds, oscillating weight in 18k red gold. Slate-coloured dial. Black alligator leather strap by Santoni. Stainless steel case. 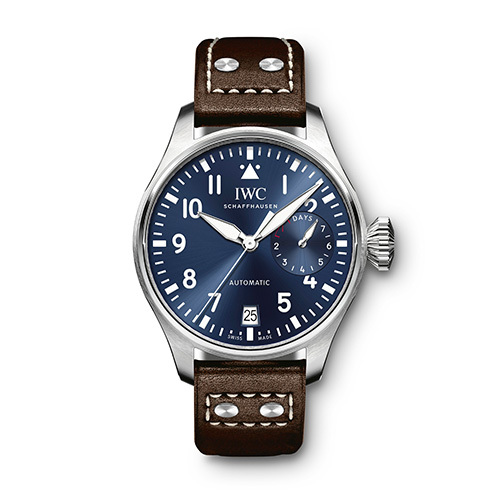 Pellaton automatic winding, IWC-manufactured movement, power-reserve up to 7 days, power-reserve display, date display, central hacking seconds, Breguet-Spiral, shielded against magnetic fields by soft-iron inner case, engraving on the rear of the little prince. Blue dial with luminescence. Brown calf leather strap by Santoni. Dimensions 46 mm. Case in 18k red gold. 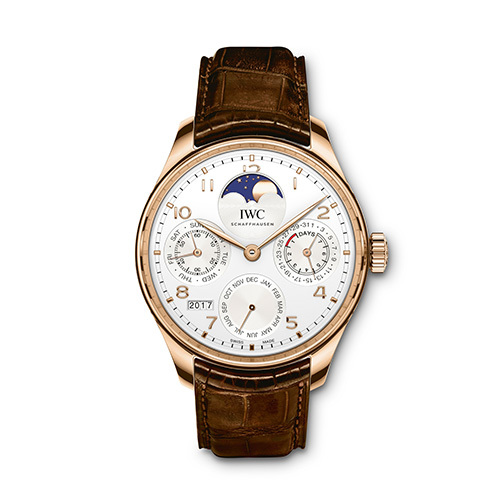 Pellaton automatic winding, IWC-manufactured movement, power-reserve up to 7 days, power-reserve display, perpetual calendar with displays for the date, day, month, year in four digits and perpetual moon phase, small hacking seconds, Breguet spiral, oscillating weight in 18k red gold. Silver-plated dial. Dark brown alligator leather strap by Santoni. Dimensions 44,2 mm. Satinless steel case. 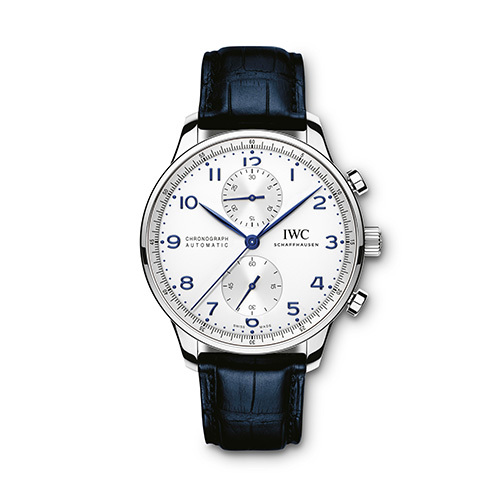 Automatic, self-winding, chronograph function with minutes and seconds, power-reserve up to 44 hours, small hacking seconds. Silver-plated dial. Blue alligator leather strap. Dimensions 40,9 mm. Case in 18k red gold. 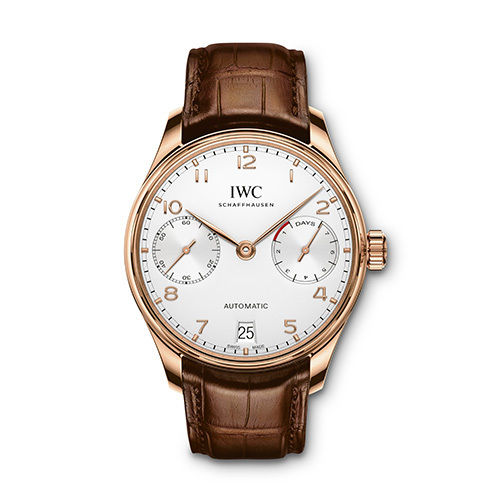 Pellaton automatic winding, IWC-manufactured movement, power-reserve up to 7 days, power-reserve display, date display, small hacking seconds at 9, Breguet spiral, oscillating weight in 18k gold. Silver-plated dial. Dark brown alligator leather strap. Dimensions 42,3 mm. Stainless steel case. Automatic, self-winding, Chronograph function with hours, minutes and seconds, day and date display, power-reserve up to 44 hours, small hacking seconds. Silver-plated dial. 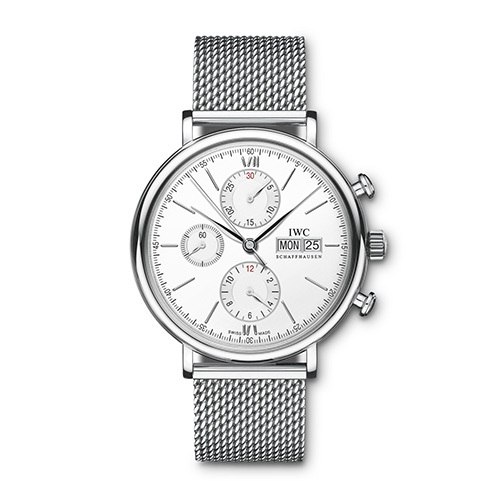 Milanese mesh stainless steel bracelet. Dimensions 42 mm. Stainless steel case. Automatic, self-winding, Chronograph function with hours, minutes and seconds, power-reserve up to 44 hours, day and date display, small hacking seconds, shielded against magnetic fields by soft-iron inner case. Black dial. Stainless steel bracelet. Dimensions 43 mm. Titanium case. Automatic, self-winding, manufactured calibre, power-reserve up to 44 hours, mechanical external/internal rotating bezel with SafeDive system, date display, central hacking seconds. Black dial with luminescence on numerals and indexes. 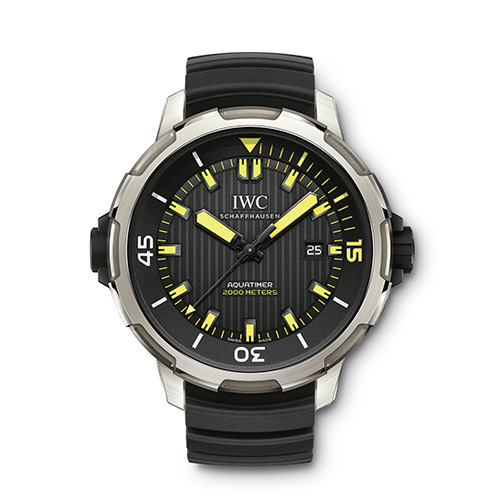 Black rubber strap with IWC-patented quick-change system. Dimensions 46 mm. 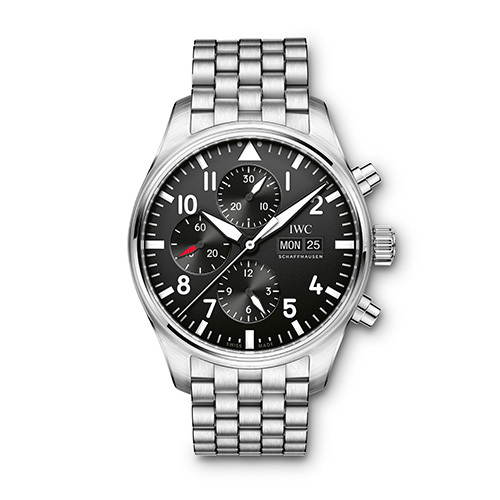 Stainless steel case. Pellaton automatic winding, IWC-manufactured movement, power-reserve up to 7 days, power-reserve display, annual calendar with displays for the date, day, month, small hacking seconds at 9, Breguet spiral, oscillating weight in 18k gold. Blue dial. Black alligator leather strap. Dimensions 44,2 mm.